New items on display Winter 2019! The Randall V. Mills Archives of Northwest Folklore is a repository of fieldwork collections and research materials on folklife in Oregon, the Pacific Northwest, and beyond. Collections include books and periodicals; student and faculty research papers and fieldwork projects; fieldwork photographs and sound recordings; and documentary videos. 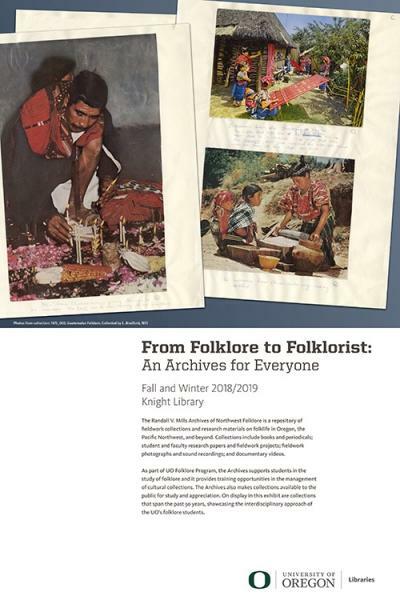 As part of UO Folklore Program, the Archives supports students in the study of folklore and it provides training opportunities in the management of cultural collections. The Archives also makes collections available to the public for study and appreciation. On display in this exhibit are collections that span the past 50 years, showcasing the interdisciplinary approach of the UO’s folklore students. Exhibit runs fall-winter, but material on display will be refreshed in December. The archives contain so many interesting collections that we couldn't fit them all in the exhibit cases at one time! Sponsored by UO Libraries and the Folklore Program. Curated by Sarah Fisher, folklore archivist and collection coordinator with the Randall V. Mills Archives of Northwest Folklore. Exhibit proposal by Nathan Georgitis (archivist for digital collections with Special Collections University Archives), Doug Blandy (director of the UO folklore and public culture program), Alina Mansfield (former folklore archivist with RVMA), and Tamara LeRoy (former student archivist with RVMA). Exhibit production by Mandi Garcia, library design and exhibits coordinator, and Jason Stone, strategic communications and writing specialist. Original materials courtesy of the Randall V. Mills Archives of Northwest Folklore.